What Makes a Puppy So Hyper in the Evening? A carefully planned feeding and exercise routine can combat hyperactivity. Adult dogs typically match their energy levels to those around them. So when the family is chilling out in front of a movie, Lucky will do the same. But it may take your puppy some time to adapt to the human routine. His hyper evening activity has a few potential causes. Your puppy has been home alone for a few hours, then all of a sudden people start arriving back from school and work. Lucky’s environment goes from quiet and peaceful to a hive of activity. You can’t really blame Lucky for getting excited, but hyperactivity is not desirable, so corrective measures are necessary. Instead of fussing Lucky and making the problem worse, introduce a brief period of minimal contact just after each person comes back. Have each person wait at least five minutes after getting in before fussing and playing with Lucky. Additionally, if Lucky is too excited, giving him a brief time-out will help him learn that hyperactivity denies him the contact he is thrilled about receiving. If Lucky is home while the family is at work, he needs something to do. TV dog trainer Cesar Millan recommends giving Lucky a job. Any activity that requires mental focus and energy counts as a job, such as solving a food puzzle, finding hidden treats or playing with a treat dispenser. This way, he is mentally stimulated in your absence. Chew toys are a good way to help him stave off boredom too. Before the evening arrives, make sure that Lucky gets a nice long walk. A tired dog is a well-behaved dog. 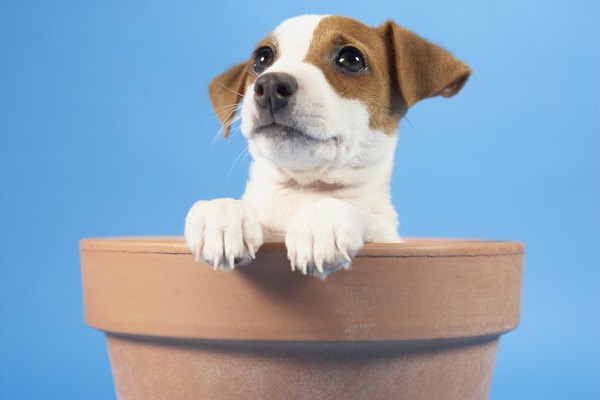 Your puppy should be getting three meals a day up to the age of 8 months, at which stage you can feed him twice a day. Give the last meal no later than three hours before you want Lucky to go to sleep. This gives him enough time to digest his food. Failing to give him sufficient time to digest his dinner before bedtime means he may struggle to get to sleep. His restless behavior may turn into hyperactivity. Puppies take a while to figure out that being left alone isn’t a permanent thing. Their instincts tell them that solitude is bad, so they whine, become distressed and sometimes howl. If your pup suffers from separation anxiety, all that tension and relief can turn into hyperactivity when you get home from work. This is different than simple excitement at seeing you, the hyperactivity is driven by anxiety. The trick to curing separation anxiety is to introduce Lucky to solitude gradually, so you can clearly show him that you always return. Why Are Chihuahuas So Hyper?